"A necessary tool for running all kind of Java apps." It is quite often that we use applications on our Windows PCs without having knowledge of what allows them to run. As consumers we see the outside of a project, the end result. As long as a program works, as long as an application does what we think it is supposed to do or what we're told it is supposed to do, we are "A ok!" But when an application doesn't work/ doesn't do what it is advertised to, we would like to know why. Many of the programs that we use on a daily basis are able to run properly because of the Java Runtime Environment. Java Runtime Environment is a tool that includes Java Virtual Machine, Java Plug-in, Web Start. Having all the necessary for running programs and applications created in java language in our computer, as for example Java Plug-in necessary for running Java applets on web browsers. It also includes Web Start which simplifies the running or web programs which require Java software. This version of J2RE is a complete download and get automatically integrated to the most famous browsers like Opera, Internet Explorer, Firefox or Google Chrome. With no doubt, Java JRE is a necessary tool for all those users who want to enjoy complete browsing experience or simply need to run a program made in java, a most used multiplatform programming language, and not to depend on the architecture of computer or a machine being used. 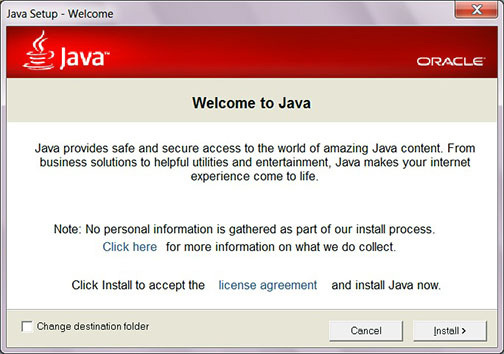 Note: For installing Java plug-in you need to have administrator permissions.